Hi all! Nope it's not Monday which mean yes, I'm a wee bit late with my Totally Stampalicious Blog challenge... but alas, here 'tis. I chose to ink up the newly released Stella Waitress. I always love this gal! I colored her with copics. The sentiment is one from her set. TS Monday - Birthday Girl! Our challenge this week is for you to create a Birthday Girl card or project. Who couldn't use more of these in their stash?! I had to use this sweetie from the Sweet Birthday Kids set. I love this set because it has a boy and a girl with two sentiments - all your kiddie birthday card needs in one set! Gotta love that! I paper pieced the balloons but the rest of her was colored with copics. I cut out the sentiment with one of my die-namics. I also added a Fishtail Flag Stax. The orange polka dots strips were cut out with my small scallop border die-namics. A little bling and some ivory jute from the Ribbon Carousel finish off the details. The sketch is the MFTWSC89. Here's a close up of the balloons... I added glossy accents to make them *shine*. And a peek at the inside. I inked up only the balloons with some versamagic ink. Be sure to check out the new releases over at Totally Stampalicious!!! LOTS of fun stuff!!! 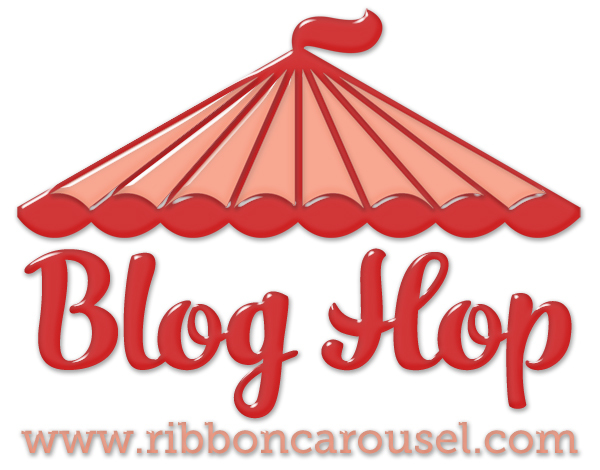 Totally Stampalicious New Release AND Ribbon Carousel Blog Hop!!! The Totally Stampalicious DT are teaming up with the talented designers from The Ribbon Carousel Crew to bring you a blog hop jam packed with crafty eye candy! We will be helping to show off not only Totally Stampalicious' September release of stamps but ALSO some ribbon and twine from the Ribbon carousel! Totally Stampalicious will be giving away their 4 newly release September stamp sets AND The Ribbon Carousel will be giving away a $20 gift certificate to the Ribbon Carousel Store! Enjoy the hop and be sure to leave some blog love along your way to be eligible for the prizes! Winners will be announced Saturday night at 8:00 PM EST. Did you notice the new blinkie on the right?!?! 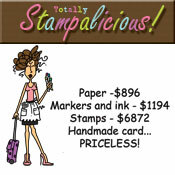 YES, Totally Stampalicious wants to give YOU free stamps for a YEAR!!! Click on it to find out the details! For my card, I've used the new Balloon Girl. She's one of 4 NEW stamp sets being released today!!! I love that big balloon and couldn't pass up the opportunity to paper piece it! The rest of the image was colored with copics. The sentiment is from the same set. And look at the lush seam binding from The Ribbon Carousel! *swoon* I added a few brads to balance out the card. Here's a close up of the vintage seam binding... I love, love this stuff! It makes the prettiest bows! Sue's card is linked to the Totally Stampalicious blog, but here it is again just incase ~~ Sue . Hi all! I managed to finish a card! It has been such a BUSY past couple of weeks.... I used the Picture Perfect PI by MFT for their guest designer challenge. That is one challenge I try SO hard to enter every month because I totally love their products! I stamped the frame a second time and cut it out and popped it up on pop dots for extra dimension. Everything is colored with copics. I wanted the frame to have a worn wooden look to it. I used the smallest of the layered rose die-namics, as well as two of the royal leaves, which I cut out of cork, for my embellie. A few pearls for the flower center and clusters of pearls add more interest. The green dp strips are the scallop ribbon border just cut in half, then I added some linen thread and tied knots on the ends. Inside shot... I used the medium scallop border and the medium leafy flourish.